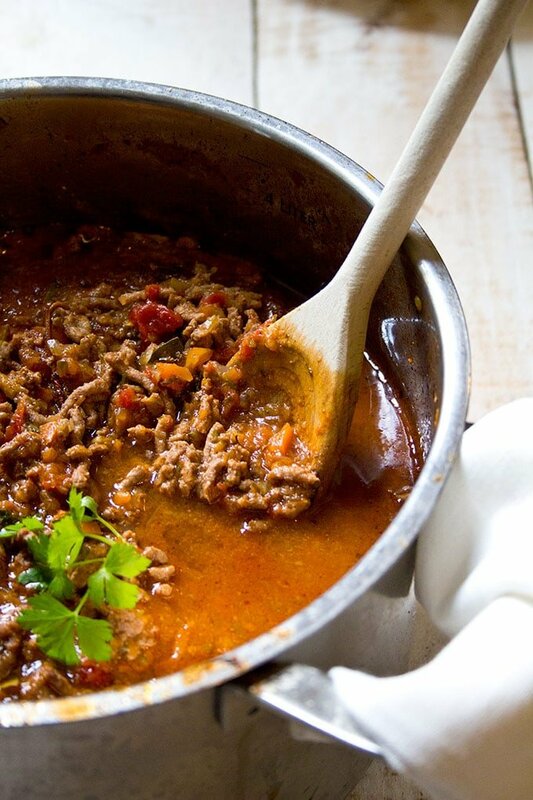 Low carb Bolognese sauce – a family favourite loaded with hidden veggies. This sauce is the essential ingredient in a variety of dishes from vegetable lasagne to chilli con carne! In the name of all people who cook, eat (and like meat), I’d like to thank the amazing person who invented Bolognese sauce. 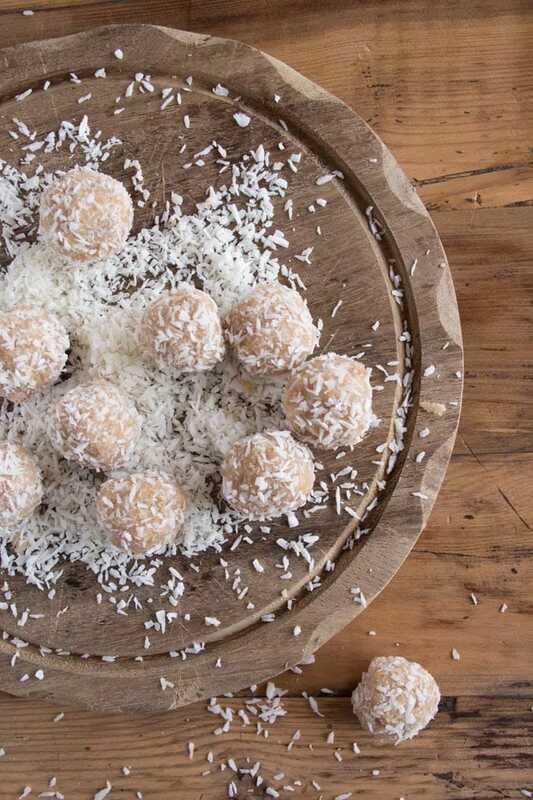 Soft, satisfying and subtly spiced: These sugar free Coconut Tahini Bliss Balls are bite-sized portions of…bliss. Bliss. It’s way more than just happiness. Bliss is a biggie. It’s that moment when things just can’t get any better. Bliss is so big that people have written books about it, amongst them Sean Meshorer’s inspirational The Bliss Experiment, which is filled with fundamental truths. So, how does Meshorer – author, yogi, philosopher and meditation instructor – sum up bliss? Bliss is an innate state of inner joy. We all have the capacity for it. External circumstances, whether positive or negative, happy or sad, do not affect it. Bliss is a state of unity, completeness and knowingness; it is a feeling of oneness and connection with all of creation. When bliss appears, you instantly recognise it as the most central of all truths. Bliss is where happiness, meaning and truth converge. Everything boils down to our pursuit of bliss. We pursue money or relationships because we think they’ll make us happy. We pursue our life’s passions because we feel they are deeply meaningful to us. Bliss is the universal place where all questions are answered and fulfillment is reached. With bliss comes an unshakeable joy, interconnectedness and a practical wisdom. Bliss is like white light. Just as pure light is the totality of all colour, bliss is the sum of all positive qualities. The components of bliss are joy, unconditional love, inner peace, power, connectedness, awe and wisdom. Sam Meshorer, you are making me feel all blissed out. Doesn’t just reading this makes you feel like you’re peacefully bathing in beautiful white light? Or at least, like you finally know how to get there? Totally worked for me. Inner joy, here I come! I’d like to add just one more thing. 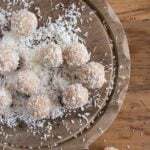 Bliss is making AND eating these Coconut Tahini Bliss Balls. I had the inspiration for this recipe when I felt like baking something. But. No eggs in the house! I rummaged around in my cupboards and found shredded coconut and ground almonds. The fridge? Desperately empty, only the door stuffed with condiments. And there it was. Tahini! A big, half-forgotten jar that had not seen the kitchen counter since we’d run out of chickpeas and beans (my kids had a big hummus phase last autumn – check out my Awesome Black-eyed Bean Hummus, which is, like the name suggests, awesome). You all know I am a big lover of EASY. Friends, the stars aligned. Inspiration struck big time. This was not the time to bake. 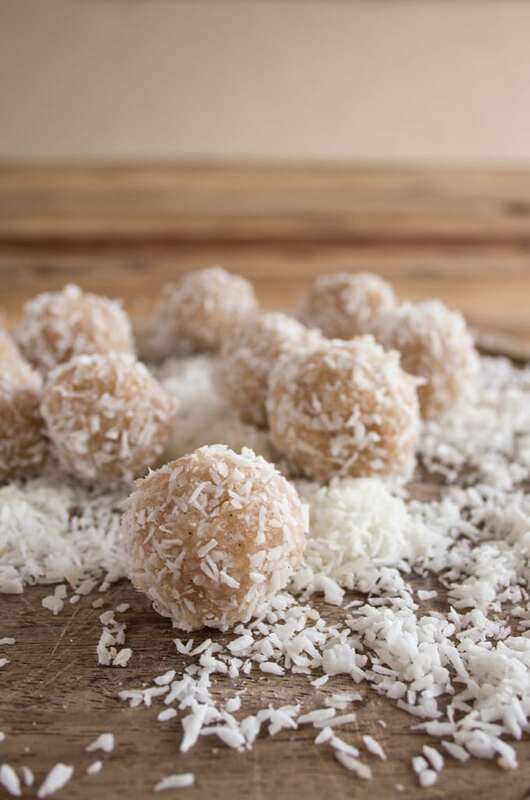 This was the time to make … Coconut Tahini Bliss Balls! No bake, no sugar, no gluten, no wheat, no regrets. Just blissfully simple clean eating. These little wonders take only minutes to assemble and are like a mini burst of sunshine on a rainy day. The delicate roasted sesame taste of the tahini, the sweetness of the coconut, the mellow nuances of vanilla and the warm flavour of cinnamon put together are simply sensational. You want bliss happening in your kitchen, right now? You are 5 minutes away from it. Just open your cupboard and get started. For another bite-sized morsel, try my Sugar Free Pistachio Chocolates! 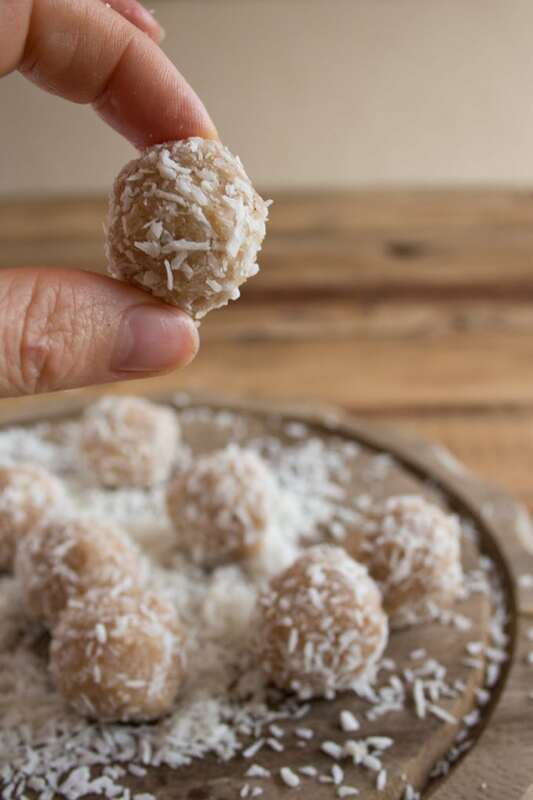 Soft, satisfying and subtly spiced: These sugar free Coconut Tahini Bliss Balls are bite-sized portions of...bliss. Blend the shredded coconut in a food processor with the coconut oil until it has formed a paste. A bit of crunch is fine. Add the rest of the ingredients and combine. Try 1 tbsp of nut milk first and test. Add more if necessary to soften the dough. Roll into bite-size balls in your hands. Cover the balls with the additional shredded coconut. The perfect summer dessert: griddled peaches with cinnamon mascarpone are a delicious combination of natural sweetness and indulgent creaminess. Topped with hazelnut crunch! Let’s talk barbecue. You can’t but love it, right? It turns any meal into a memorable social mini event. There is the whole primal effort to get it started. Then the big flames when you finally get it going – cue celebration mood, excitement! Your little private bonfire. And of course there is the smoke that always blows in the direction of the table and makes you think you shouldn’t have worn that leather jacket because it’ll smell of burnt sausage for weeks. Last but not least, the food! ANYTHING tastes great cooked on a barbecue…. 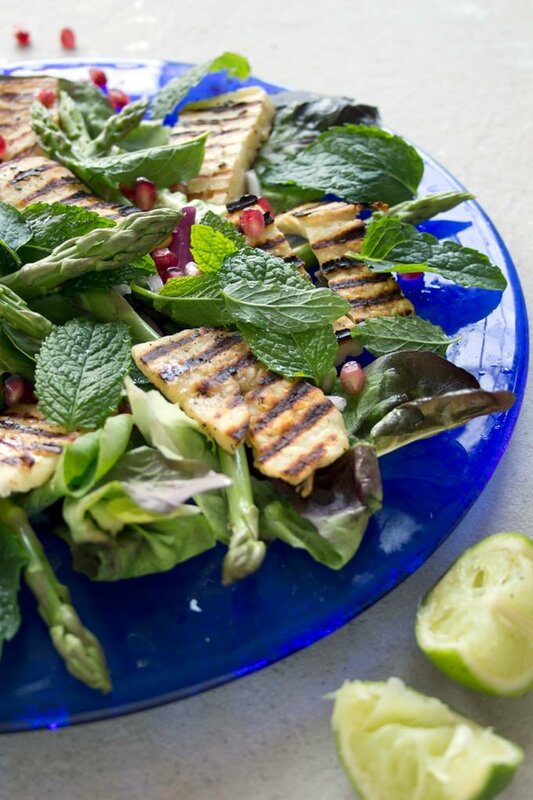 A feast for the eye and super-tasty: this halloumi and pomegranate salad is easy to prepare and packed with flavour. Is it possible to make tasty waffles without grains and sugar? Oh yes, it is. 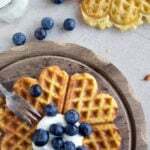 Keto low carb waffles – not just as good, but better than the real thing! We do not have a sandwich maker at home. But I have inventive children with a wild, mad love for cheesy panini. So every once in a while the poor old waffle maker is dragged out and in goes some sliced bread with a gigantic stack of ingredients wedged in between. What comes out looks a bit tortured, but tastes great all the same. As of yesterday, our waffle maker will be put to use a whole more often. For actual waffles, friends. For I have discovered a recipe that actually tastes better than the full-on wheat-and-sugar version. Who’d have thought that some eggs, butter, a few spoonfuls of coconut flour and a few other magic ingredients could make a whole noisy family quiet in astonishment for… well, at least five seconds. You want some happy silence? Make low carb waffles! 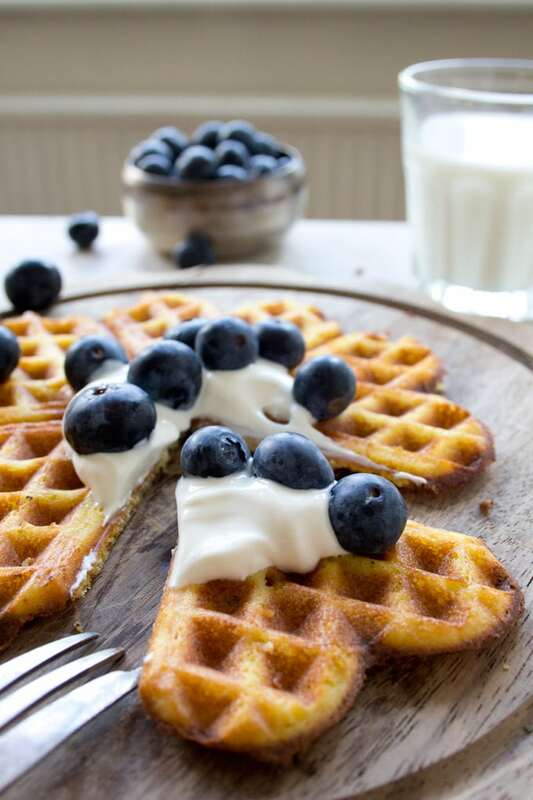 Thank you for this one, DitchtheCarbs..
As you can see, I like my waffles with creme fraiche and blueberries – but any berry combination, whipped cream or a dollop of coconut cream would work well. Do you do school lunches? 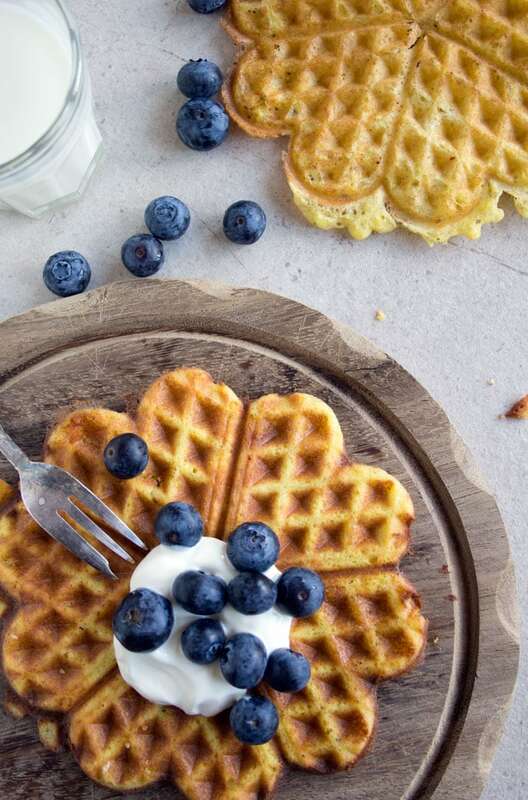 Make little heart-shaped waffle sandwiches filled with cream cheese and berries! The secret to supreme waffle fluffiness is to separate the egg whites and the yolks and beat the egg whites until they form stiff peaks. This mixture is then folded gently into the batter. I can assure you though that even if you do not manage to get your egg whites perfectly stiff – I find they can be a bit temperamental – the waffle will still turn out fabulous. As long as you manage to beat some air bubbles into your egg whites (i.e. make them turn white), you’re good to go. If you do not have a waffle maker, just make low carb pancakes instead. They won’t look as pretty (I am a sucker for the little heart shapes), but definitely more handsome than my childrens’ tortured cheese sandwiches. 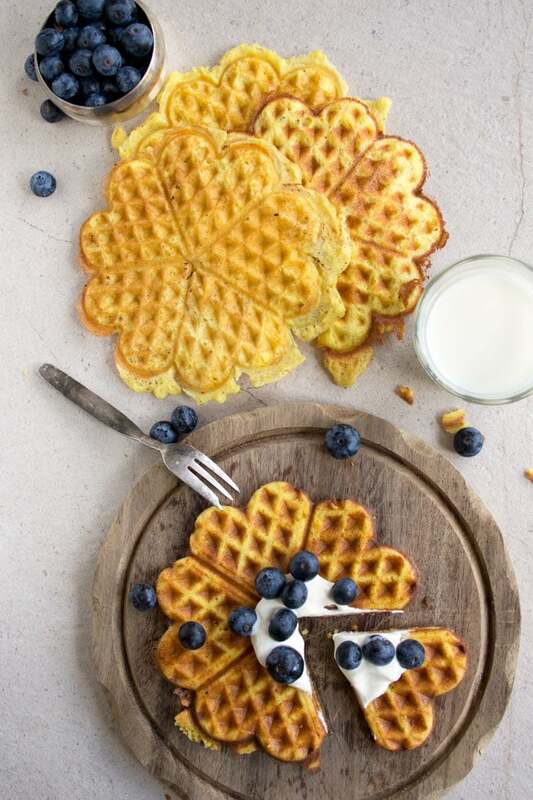 Grain free, sugar free, superbly fluffy and extremely tasty: Low Carb Waffles. You'll never look back. Whisk the egg whites until they are firm and form stiff peaks. You have to use a clean, non-greasy bowl for this and be a bit patient. In a second bowl, mix the egg yolks, coconut flour, sweetener and baking powder. Add the melted butter slowly and mix well to ensure your batter is nice and smooth. Place enough of the waffle mixture into the warm waffle maker to make one waffle. Cook until golden. You might have to "grease" your waffle maker with a bit of butter so the waffles do not stick. They have a more delicate consistency than wheat waffles, so take extra care when removing them. Enjoy with cream and berries or with sugar free syrup! Deliciously nutty, pleasingly crunchy and protein-packed: Cashew Quinoa Granola is grain free, sugar free and gluten free – a real feel-good breakfast! There I was last night, sitting around a table with a couple of friends discussing… granola. Intensely. This is an odd thing that happens when you reach a certain age – things you never used to think about suddenly become so captivating you wish you could take notes. We started off with the merits of my grain free, sugar free Peanut Butter Granola, briefly agreed about the evilness of shop-bought granola and then moved on to quinoa, the health foodie’s favourite carb replacement. None of us had ever tasted quinoa granola, yet we were vaguely aware there are quinoa granola recipes floating around out there. Would quinoa pop like corn when in the oven? Would it retain its nutty taste? Could it possibly be as good as peanut butter granola? Today, friends, I have answers to all these burning questions. Most granolas use honey, sugar or syrup to make the nuts, seeds and grains stick together in clusters. Because we are sugar free here at Sugar Free Londoner (obvsly), we have to embrace a less clustery, yet just as tasty granola. The secret of this recipe is an old granola trick of mine: nut butter and spices! I used cashew butter for this recipe, which has a slightly sweet taste and does help the nuts and quinoa stick together, along with a pinch of salt and plenty of mixed spice. You could sub cinnamon if you prefer. One can never go wrong with cinnamon! 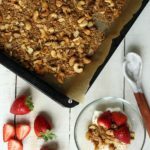 This cashew quinoa granola is gluten free, grain free, sugar free and tastes great with yoghurt and fruit. How about some fun facts? Quinoa (pronounced “keenwah”) is a seed harvested from a plant species called goosefoot. It is officially a seed and part of a group of pseudo-cereals, making it neither a cereal nor a grain, and more closely related to spinach and beets than to cereals or grains. As for quinoa in granola, this is the lowdown. It does not pop, but stays pleasingly crunchy, nutty-tasting and makes for a great alternative to oats. After all, it’s all in the variety! Crunchy, nutty, super-healthy and grain free: Cashew Quinoa Granola tastes great with some yoghurt and fruit. Mix all ingredients in a bowl and work in the cashew butter, making sure it is evenly distributed. Bake in the oven on a baking sheet for ca 15 minutes. Keep a close eye and turn regularly so it does not burn. Once cooled, this granola keeps in an airtight container for two weeks.